Dr. Sam Nugen, Associate Professor of Food & Biosystems Engineering, Dept. of Food Science at Cornell University in Ithaca, NY, USA, will be presenting at Pittcon 2018, in Orlando, USA, next February. Nugen previously worked in the food industry as a research engineer prior to returning to Cornell for his doctorate. 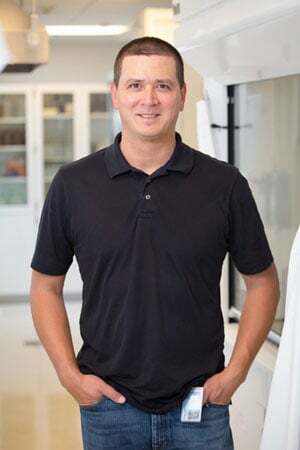 His first faculty position was at the University of Massachusetts, Amherst, then in the summer of 2016, he returned to Cornell and set up his lab. In this interview, SelectScience® finds out more about Nugen’s research on food and water safety, and about why he’ll be attending Pittcon. My lab focuses on low-cost diagnostics for food and water safety. While many of us take our access to safe food and drinking water for granted, a large portion of the world lack these necessities. We are developing biosensors with an emphasis on low cost and sensitivity. Given the regulatory requirements for food and water testing, we typically are required to test large sample sizes, such as 100 mL of drinking water. Therefore, the true bottleneck for rapid testing is the separation and concentration of bacteria from the sample matrix. In order to develop a pragmatic approach, we have been working on technologies which incorporate these steps prior to a final detection assay. SS: Which technologies have you used to develop your inexpensive micro total analysis systems? Our current approach to detect bacterial pathogens and indicator organisms involves genetically engineering bacteriophages. Researchers in my lab use tools in synthetic biology, materials science, genetic engineering, and nanotechnology. While my students receive broad experience in these fields, they have really become experts in their projects. While we have developed our own magnetic nanoparticles and electrodes, we also have been using new molecular biology methods to engineer the phages. SS: Your session at Pittcon 2018 is entitled “Designing First Generation Nanobots for Food Safety via Phage Engineering” – what can listeners expect from this talk? I plan to present the work my lab has been performing in E. coli detection in drinking water. While the world has been holding its breath for mechanical nano-scale robots to become reality, our approach is to begin with a biological scaffold for engineering a nanobot, specifically a virus. Advances in synthetic biology and materials science allow us to manipulate bacteriophages to perform complex tasks. Nature has evolved these viral predators which bind and infect specific bacteria. At Pittcon, I will describe how we have developed magnetic bacteriophages which can efficiently bind, separate, and concentrate bacteria from large drinking water samples. The phages can then allow the detection of low concentrations of bacteria. SS: How does your attendance at conferences like Pittcon influence your research (especially with an inter-disciplinary team)? Given the cross-disciplinary nature of our work, Pittcon offers us a venue where we can learn about other aspects of biosensors that can help us. There is a broad range of technologies, ranging from physical to biological sciences being presented. The conference allows me to find new collaborators and technologies which are outside of our expertise. 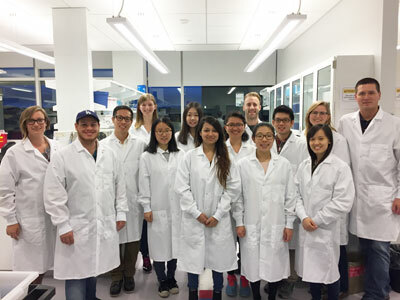 The Nugen Research Group at Cornell Univeristy, USA (shown above) is an interdisciplinary team working on the development of rapid diagnostic assays for food and water. We are addressing the current limitations of bacteriophages for use in diagnostics and therapeutics. These include customizing host ranges and improving the ability of the phage to avoid host resistance. The battle between phages and bacteria has been described as a co-evolutionary arms race with the bacteria gaining resistance, and the phage overcoming it. Given that specific bacteria can harm us while their respective phages cannot, we plan to help tip the scales of that arms race.